Tension links are manufactured in accordance with the specific requirements of our customers from high-strength, fine-grained structural steels or stainless steels and are provided with high-quality surface protection. The measuring body is designed using the latest F.E.M. (Finite Element Method) calculation methods and enables an accurate prediction of the expected measurement accuracy of the tension link in the application. With tension links, the force is introduced via the bores in the measuring body. 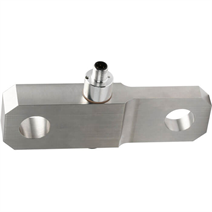 The registration of the tensile or compressive force is using the latest thin-film technology which, through miniaturisation, can be placed precisely in the force flux and thus delivers high-precision measuring results. The integration of redundant measuring systems in the smallest space thus enables a simple upgrade to two-channel sensor technology to fulfil safety requirements, e.g. per EN13849, without changing the exterior geometry of the tension link. Our new integrated amplifier series is tailor-made to fulfil your safety requirements from pl-c to pl-e and, through robust EMC design, satisfies far beyond the 200V/m limit. Our tension links undergo various quality tests before they are delivered to our customers. These high-quality force transducers are used when there are large loads in play, such as in crane weighers or other large lifting equipment. They are also approved for explosive atmospheres. Other geometries, rated loads and electrical outputs of tension links can be realised on request.